Author: Teleky, Richard Set In . . . When Karl Moran returns to Toronto for his friend Jay's funeral in 1992, he discovers that Charlotte, a close friend from his university days, was murdered in 1975 - almost 20 years earlier. Troubled by this revelation, Karl, a university archivist living in the U.S., sets out to reconstruct Charlotte's life and murder by revisiting the time that he and Charlotte shared in the '60s and piecing together her last days. While there is a mystery at the novel's heart, and the details of Charlotte's death aren't revealed until the final chapters, Pack Up the Moon is not a detective story; it is a contemporary memento mori , an elegy about friendship, faith, and lost love. Set in Toronto, Ontario, the university town of Oberlin, Ohio, Sarasota, Florida, and briefly in Paris, France, the story unfolds in two time periods - the early '90s and the late '60s - shifting eloquently between past and present with cinematic flourish. Karl and Charlotte first meet when Karl, then a Vietnam War draft dodger and young graduate student, arrives in Toronto and is befriended by the alluring, sophisticated Charlotte, a fellow student from a wealthy Catholic family. Their friendship quickly develops into a complex bond, at a time when the feminist and gay movements are just beginning, a moment of social change these characters unwittingly embody. In coming to terms with his friend and former lover Jay's death and Charlotte's equally untimely demise, Karl comes to understand the significance of faith for both of them and sees more deeply the responsibilities and limitations - of friendship. 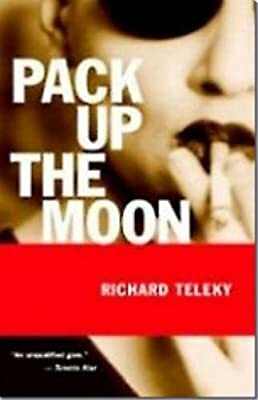 Told in Teleky's spare yet elegant prose, Pack Up the Moon is a moving account of how the connections between people can fail, and how the aftermath of unintended betrayal can reverberate decades later.